Community leaders and elected officials donned hard hats this week as construction begins on a multimillion-dollar project that will bring critical affordable housing to a Philadelphia neighborhood. On Friday, the Philadelphia Housing Authority broke ground on a $23 million investment that will add 55 apartments and other neighborhood upgrades in the city's Strawberry Mansion section of North Philly. Gov. Tom Wolf, City Council President Darrell Clarke and other representatives tossed the first shovels of dirt at the ceremony. 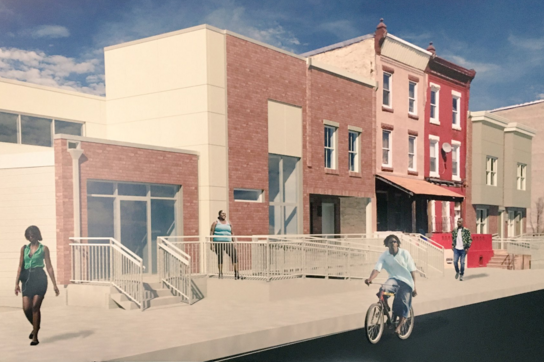 "This new housing development - which will provide several different housing options to the residents and families of Strawberry Mansion - will help to ensure that there is affordable housing available here, so that the neighborhood's residents have real choices when looking for homes where they can build and grow their families," Wolf said. Officially known as the Strawberry Mansion Apartments, the complex will be located between 32nd and 33rd Streets and Arlington and Berks Streets. After decades of economic downturn, housing officials are attempting to take advantage of recent revitalization efforts in the area. The project will offer one-, two-, three- and four-bedroom units. More than half - 38 homes - will be one-floor units on the ground level to accommodate visitors with disabilities. "These homes will be set in an ideal location next to Fairmount Park," said Kelvin Jeremiah, PHA president and CEO. "We believe that as a result, even more potential homeowners will be attracted to the neighborhood and existing residents will appreciate an even more appealing community." PHA officials said a majority of the funding - $13 million - for the project comes from private investors via the sale of low-income housing tax credits. The program incentivizes organizations to develop housing for seniors, disabled citizens and families. "Affordable housing yields positive economic benefits that aren't confined to four walls, but extend to the block, the neighborhood, and the community," Clarke said. Earlier in the week, Mayor Jim Kenney's administration warned about the potential impact of federal cuts to U.S. Department of Housing and Urban Development. President Donald Trump proposed a 13.2 percent decrease in funding, the effects of which would be felt at a local level. PHA manages about 14,000 in Philly, where a fifth of affordable rental units has been lost since 2000. Federal cuts would put force housing officials to identify new sources of funding. The Strawberry Mansion complex is expected to be completed next year.